EghtesadOnline: US President Donald Trump on Tuesday pulled out from the Iran nuclear deal negotiated under his predecessor, promising to reimpose tough sanctions against Tehran and threatening other countries who may be reluctant to follow his lead. In the past, such sanctions severely hit Iran’s economic relations with global partners. But this time, Iran is preparing to counter that threat by positioning itself as an indispensable hub for transit, connecting distant parts of Asia and beyond. At the heart of this plan is Chabahar in southeastern Iran. In 2016, India, Iran and Afghanistan signed a trilateral connectivity agreement that bypasses Pakistan, which has barred Indian and Afghan trucks laden with goods from reaching each other’s markets through its territory. India has already begun to ship wheat to Afghanistan via Chabahar and has promised to invest $20 billion to develop the port and other infrastructure. India has also asked Japan to partner with it in Chabahar. But Tehran isn’t taking any chances by depending only on New Delhi and Tokyo—close partners of Washington. Iran has made clear it is also happy to see Pakistan and China join the Chabahar project. And along with the other busy Iranian port of Bandar Abbas, Chabahar will be part of the Russia-led 7,200-kilometer-long (4,470 miles) International North-South Transport Corridor that envisages multimodal transportation of freight from India to Astrakhan and beyond. Dry runs by Indian freight companies have shown that this corridor is 30% faster than shipping goods through the Suez Canal. Iran hopes that promise will make countries think twice about pulling out even if the Trump administration imposes fresh sanctions. 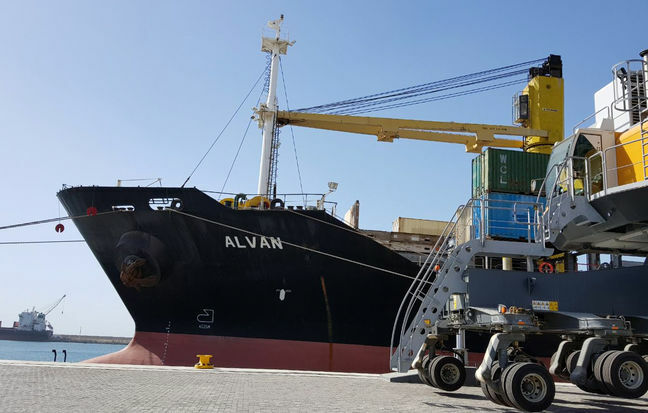 “The port is the best entry point to connect three continents: Asia, Europe and Africa,” says Abdolrahim Kordi, managing director of Chabahar Free Trade Zone. Through the development of the port, India wants to reclaim the influence it lost owing to the bloody partition in 1947. This port allows India to sidestep Pakistan, which has been blocking its access to Afghanistan and Central Asia. But the stakes are high for others too. The port sits barely 45 miles from Pakistan’s Gwadar Port where China is investing $46 billion as part of its $2 trillion Belt and Road Initiative. The proximity of these two ports promises a vigorous contest between China and India, both desperate to mark their territories and protect their oil and gas supply lines. Iran has given India management control of Chabahar Port for 18 months, which is expected to be extended. But India’s pace in project execution is proving glacial. Former Iranian diplomat, Abdolhamid Fekri, now associated with a government think tank in Tehran, wonders why “Indian ships can’t come on a friendship trip to Chabahar and stamp their presence”. Worries about the sanctions Trump has announced and a struggle to find European banking channels to move funds to Iranian projects have hobbled India’s efforts, though Iranian officials dismiss New Delhi’s financing worries by pointing to Dubai-based routes that have been used before. India’s Arab-world friends are also dissuading it from investing heavily in Iran. Iranian authorities are categorical that Tehran may consider giving the port to someone else if the Indian firm with the port’s management control—India Ports Global Limited—fails to meet deadlines. Already, Iran’s Foreign Minister Mohammad Javad Zarif has invited Pakistan and China to invest in Chabahar. In January, Indian Shipping and Transport Minister Nitin Gadkari described the port as a “growth engine” for India to access Afghanistan and Russia. Either way, the equation for Iran is simple. Trump hopes sanctions will scare away Iran’s friends. But Iran is counting on its potential as a transit hub as a weapon to counter that. And Chabahar is the tip of that spear.